The most famous Carnival in Italy! Just before Lent begins, carnival festivities take place all around the world.But it’s the Italians who really know how to celebrate this vibrant, colourful festival! 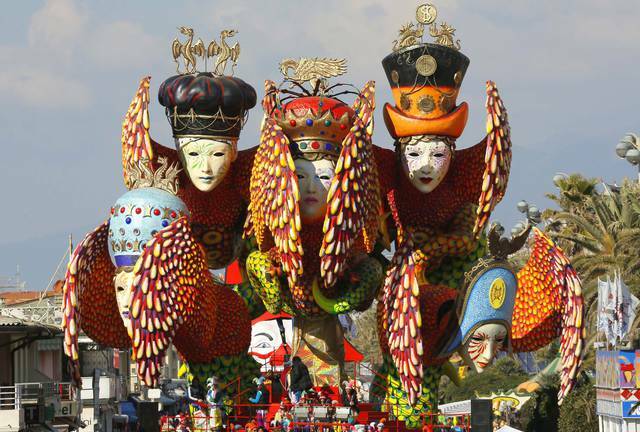 One of the most famous carnivals in Italy and in fact the whole of Europe, is the Viareggio carnival. Normally a pleasant seaside resort on the northern coast of Tuscany, this city really comes to life when carnival arrives. So why not rent a villa on the Tuscany coast, and come join in the fun? As the period of Lent actually gets underway, carnival celebrations in Italy have usually calmed down somewhat, but this is definitely not the case in Viareggio! The celebrations run throughout the forty days and nights, with parades every weekend during February. The locals in Viareggio really do know how to put on a good show, so it’s easy to see why this carnival is so popular. In fact, hundreds and thousands of visitors from all over the world flock to the city to get a piece of the action. So how did the famous Viareggio carnival actually come about? It was in 1873, when a group of locals decided to organise a procession one Sunday, consisting of a few floats that travelled up and down the main street. A masked protest also took place, and people aired some of their pent up dissatisfaction with various social issues. This parade proved to be very popular, and so continued each year, always with a sprinkling of good humour. The celebrations have definitely become more elaborate as the years have passed, and now include many shows and parades, each one as lively and dynamic as the next. Here, you can see a huge collection of floats, which need to be seen to be believed, as they are true works of art, and often require months of construction and dedicated craftsmanship. The floats are home to giant paper maché figures, usually depicting current politicians, sportsmen and other celebrities, which are fully animated, and wave at the crowds below. Some of these floats can be up to 5 or 6 storeys high, and weigh around 40 tonnes! The parades start in the town square, and continue on to the seaside promenades. As well as the parades, there are plenty of other things to see and do, including live bands and performers from all over the world, musical comedies and special carnival menus in restaurants. Make sure you also don the ‘Burlamacco’ clown mask, the official mask of the Viareggio carnival! So why not pay a visit to the true home of the Italian carnival? We have a large selection of Tuscan coast villas and apartments, so you know you’ll be able to find the perfect base to return to when you have worn yourself out after days of carnival fun!